Updated Friday April 5, 2019 by Alysha Thorpe. Each organization -- whether it be a league, travel team, showcase or tournament -- should establish rules to ensure that players must follow the guidelines while playing in that league. Ultimately, it is the responsibility of the parent and the athlete to ensure that the player follows the guidelines for his age group over the course of a year -- given that he will oftentimes play in multiple leagues with different affiliations covering different times of the year. 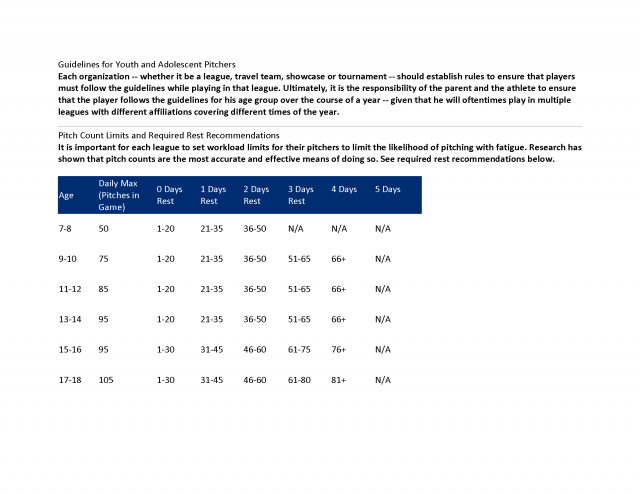 It is important for each league to set workload limits for their pitchers to limit the likelihood of pitching with fatigue. Research has shown that pitch counts are the most accurate and effective means of doing so. See required rest recommendations below.